← Tell the government about your apps! 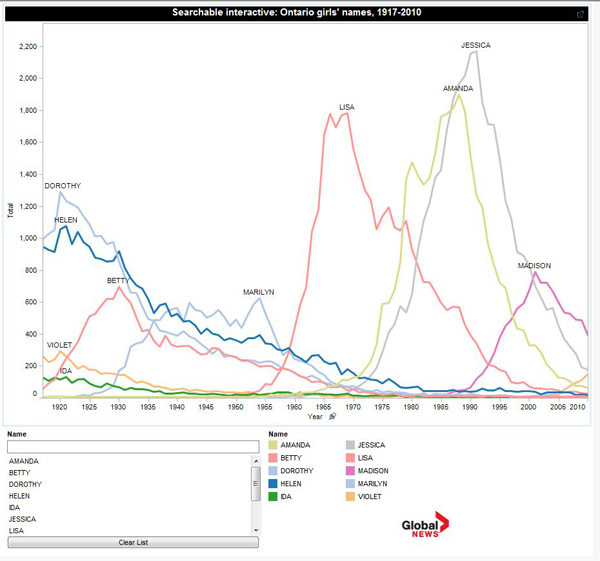 When we asked the Ontario vital statistics people for historical baby name data going back as far as electronic records were available, I thought we’d turn up 20 years or so – the equivalent Alberta data is available from 1990. So it was a wonderful surprise when a spreadsheet popped up in my e-mail with totals for boys’ and girls’ names recorded in the province going back to 1917. The result is a pair of searchable interactives showing the ups and downs of thousands of Ontario baby names covering nearly a century. Charleses and Elizabeths both peaked in 1953, the year Elizabeth II was crowned. Elizabeth has another spike after the 1959 royal tour to Canada – a marathon one by modern standards, at 45 days. Marilyns peaked in 1956. It’s hard to tell whether the main influence was actress Marilyn Monroe, then at the height of her career, or swimmer Marilyn Bell, whose arrival on the Canadian shore of Lake Ontario two years earlier had attracted hundreds of thousands of people. Linda, a juggernaut name of the postwar baby boom, peaked in 1947 – Lindas had been rocketing upward in popularity as the Second World War progressed – and declined just as suddenly. Other classic postwar names are Donald (second peak in 1947) Barbara (peaks 1947), Sharon (peaks 1947) and Carol (peaks 1946).